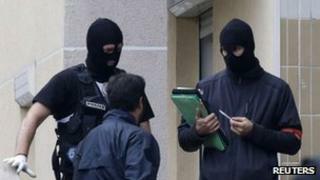 Prosecutors in France have said an alleged Islamist terror cell was planning the biggest bomb attack on France since the mid-1990s. Police arrested 12 people in raids at the weekend, during which one suspect was killed as he fired on officers. Five of the detainees have since been released but seven remain in custody, on suspicion of terrorist activity. Bomb-making materials were found during the raids, which followed an attack on a Jewish shop last month. Two suspects are also suspected of involvement in a network for Islamists waging jihad abroad, Paris prosecutor Francois Molins said on Thursday. The alleged cell, he said, was "probably the most dangerous" France had seen since the Algerian-based GIA (Armed Islamic Group), which carried out a series of attacks in 1995-96. Mr Molins, the Paris prosecutor, said the explosive ingredients found garage in the Paris suburb of Torcy on Tuesday night could have made "exactly the same kind of device as was used in 1995 by the GIA". Police had found a large quantity of potassium nitrate, sulphur, five metres of cable, alarm clocks, headlamp bulbs and a pressure cooker that could serve as a bomb casing. In their deadliest attack on France in 1995, the GIA killed eight people and injured 100 with a bomb on the Paris Metro. Mr Molins also said that one of the detainees had acted as a contact for would-be jihadists while another had travelled to Egypt and Tunisia. A number of foreign Islamist militants, including Europeans, have been fighting in Syria on the rebel side, against the government of Bashar al-Assad. Two Britons, a man and a woman, were arrested this week at London's Heathrow Airport on suspicion of travelling to Syria in support of alleged terrorist activity, and specifically of a role in the abduction of a British photographer there. The French police raids followed an attack on a kosher grocery in the Paris suburb of Sarcelles on 19 September, in which one person was injured. The man alleged to have organised the attack, 33-year-old Jeremie Louis-Sidney, was shot dead at his home in Strasbourg on Saturday in an exchange of fire with the police. An ex-prisoner who served time for drug-trafficking, Louis-Sidney had recently converted to Islam. Videos recovered from his apartment show him rapping about the 11 September 2001 attacks on the US, and boasting that it was just the start. Mr Molins said his fingerprints had been found on the remains of a grenade thrown into the kosher grocery store in the Paris suburb. The French authorities have been on high alert for possible terror attacks after French Islamist Mohamed Merah murdered three Jewish schoolchildren, a rabbi and three paratroopers in and around Toulouse before being shot dead in a police siege of his flat. French President Francois Hollande has said there will be "total mobilisation of the state to fight all terrorist threats".